Credit notes are created in Accounts receivable to reduce or eliminate the amount the buyer has to pay. Please note that the credit note costs the same as a regular invoice. Reimbursing: In case of having to refund money to the customer, please arrange for a method suitable for both parties. Lyyti Oy is simply the payment service provider and is not in charge of refunding. 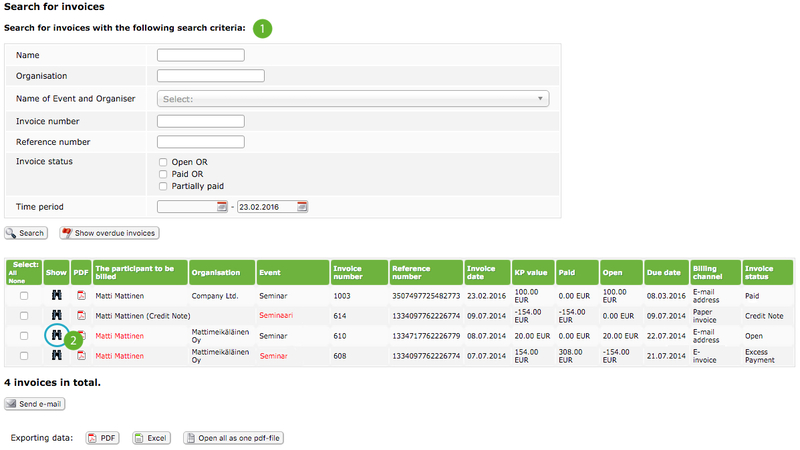 You can search for the invoice by the payer's name, company, invoice number etc. Open the invoice by clicking on the binoculars. At the bottom of the page, click Create credit note. You can send the credit not to the participant, if necessary. Finally, click Create Credit Note. Open the original invoice A (e.g. 100 €) in Accounts receivable and open it by clicking the binoculars. Click Create a copy of invoice and select products for the new invoice (=matching the sum the participant has already paid, e.g. 75 €). Copy the new invoice's (B) reference number. Open the original invoice A again in Accounts receivable and open it by clicking the binoculars. Edit the transaction (75 €) by clicking the pen icon, paste the earlier copied reference number (of new invoice B) and save. Now the transaction of 75 € is moved to the new invoice. Create a credit note to the original invoice A (100 €) by clicking Create credit note (see instructions above). Open the invoice A (100 €) in Accounts receivable and open it by clicking the binoculars. Open the original invoice A (100 €) again in Accounts receivable and open it by clicking the binoculars. Create a credit note to the original invoice A by clicking Create credit note (see instructions above). Lyyti is not responsible for refunding or editing invoices, so if you want to refund your participant(s), please contact them and agree how you can refund them. After refunding an invoice, mark this in Accounts receivable so your reports stay up-to-date. Add a negative sum which is the amount you refunded to the customer, e.g. -25 €. Mark also when and which account the money was paid from.